For equivalent regional tools refer toSpecial Tools. Note:Prevent the crankshaft from rotating clockwise orcounterclockwise before using compressed air in the cylinder.Rotation of the crankshaft may cause damage toEN-43653holding tool. If equipped, with a manual transmission leave thetransmission in first gear with the vehicle on the ground and theparking brake set.If equipped, with an automatic transmission, remove thestarter. Refer toStarter Replacement.If equipped with automatic transmission, installEN-43653holding tool.Remove the camshaft. 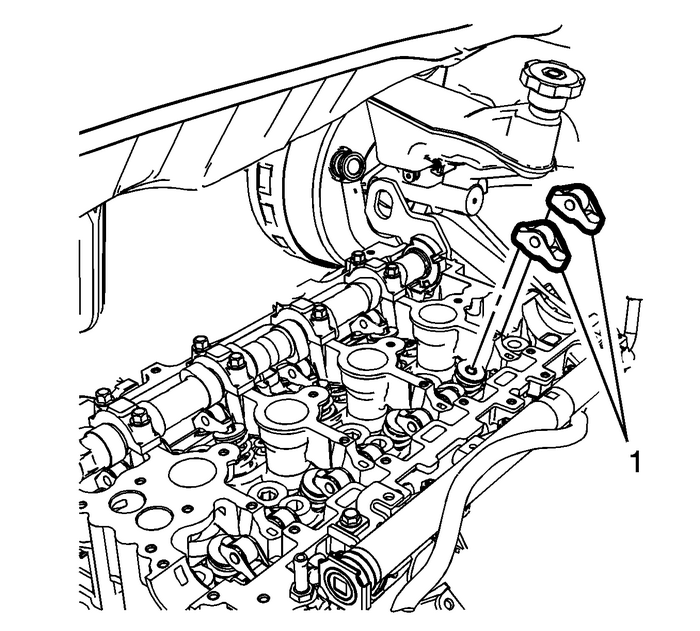 Refer toIntake Camshaft and Valve Lifter ReplacementorExhaust Camshaft and Valve Lifter Replacement. Remove the camshaft roller followers-(1). 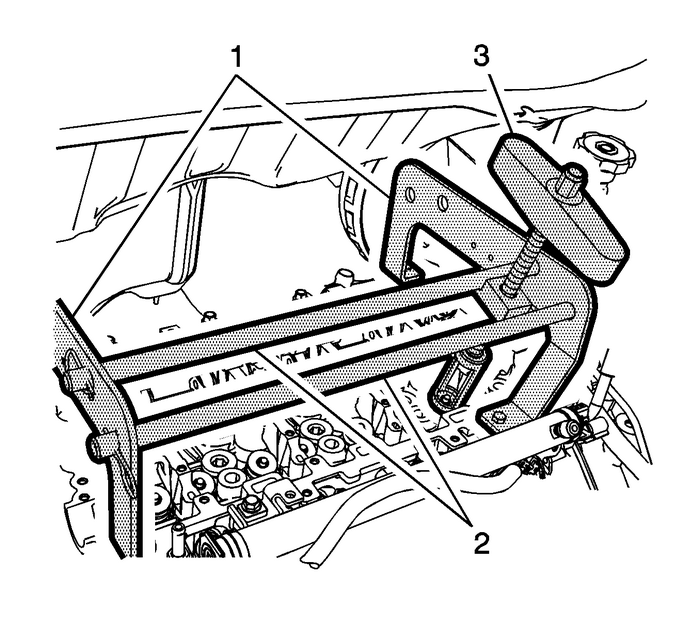 Install theEN-43649-10adaptor set(1) to the front and rear of the cylinder head.Install the cross bars and locks-(2) of theEN-43649compressorto the valve spring compressor adaptors.Remove the spark plugs. Refer toSpark Plug Replacement.Install an air hose adapter into the spark plug hole.Attach an air hose to the adapter and pressurize the cylinderto 690-kPa (100-psi).Compress the valve spring using the valve springcompressor-(3). Remove the valve spring keepers-(1).Remove the valve spring-(3) andretainer-(2). Using theEN-36017seal remover(1) install the NEW valve seal. Fully seat the seal ontothe valve guide. 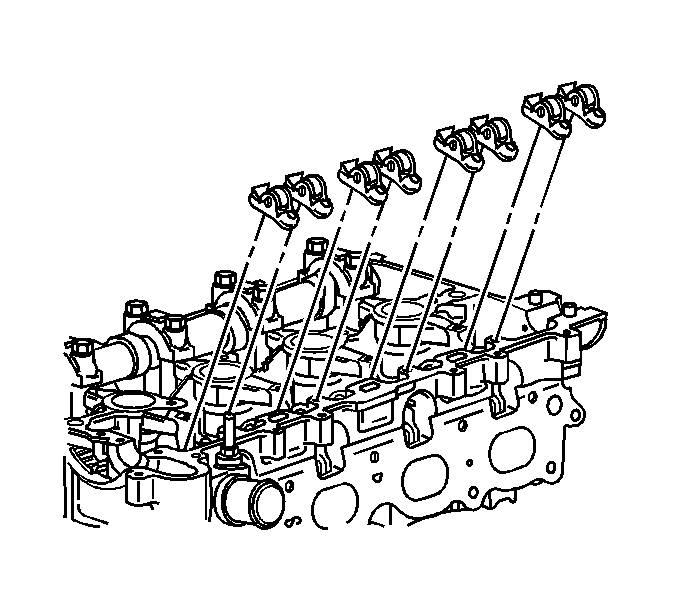 Install the valve spring-(3) andretainer-(2).Compress the valve spring using the valve springcompressor.Install the valve spring keepers-(1).Disconnect the air hose and air hose adapter.Repeat steps 1–5 for additional cylinders. 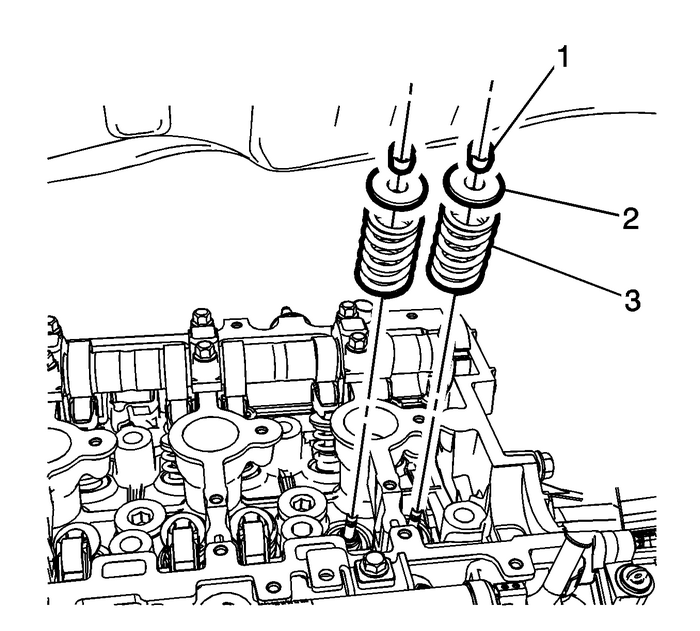 Remove theEN-43649compressorandEN-43649-10adaptor setfrom the cylinder head.Install the spark plugs. 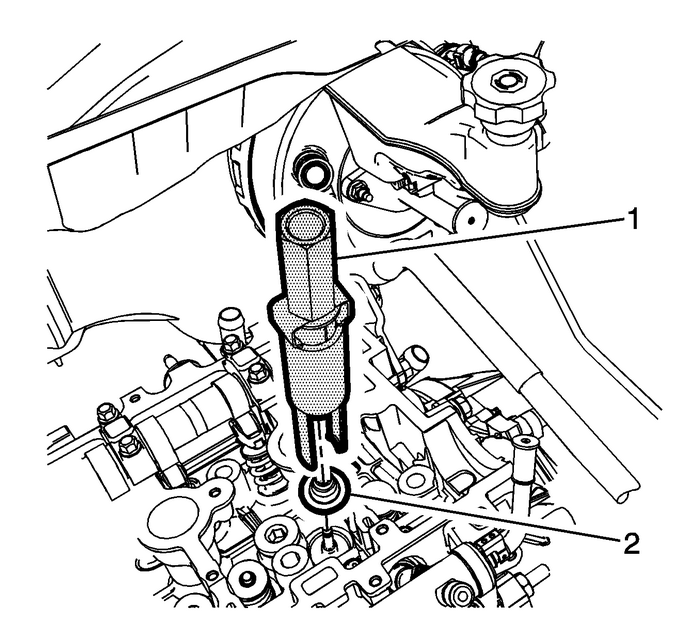 Refer toSpark Plug Replacement. Install the camshaft roller followers.Install the camshaft. 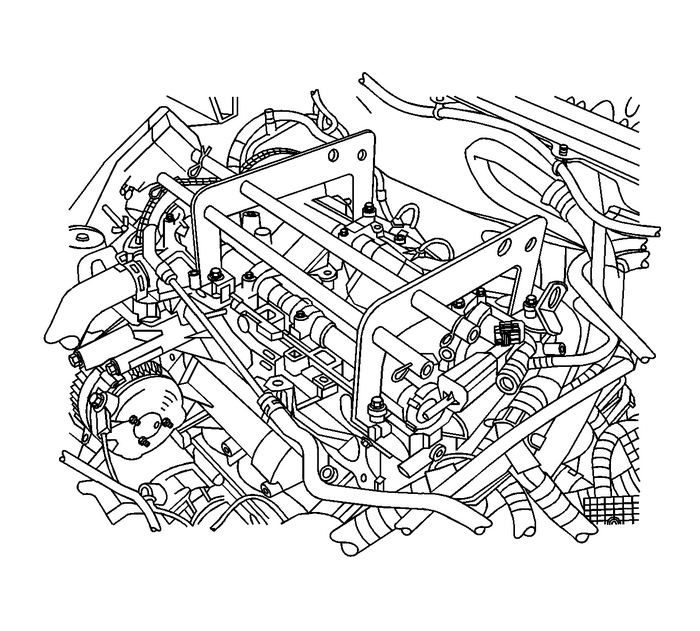 Refer toIntake Camshaft and Valve Lifter ReplacementorExhaust Camshaft and Valve Lifter Replacement.If used, remove theEN-43653holding tool.If removed, install the starter. Refer toStarter Replacement.